Every day, healthcare becomes more complex, and with that complexity comes a growing need to focus on reducing diagnostic errors. A recent Institute of Medicine (IOM) report, Improving Diagnosis in Healthcare (Balogh, Miller, & Ball, 2015), estimates that 5% of adults seeking outpatient care experience a diagnostic error, while one in 10 patient deaths and up to 17% of adverse events are directly tied to such errors. For most emergency departments (ED), engaging discharged patients has not been a traditional priority. However, there is growing evidence that proactively creating a feedback loop for patients not only contributes to more accurate diagnosis, but also improves patient satisfaction. High volume. For every one inpatient, four ED patients present in the average hospital (“FastStats,” 2015; “Fast facts,” 2014). Malpractice claims. Diagnostic errors are the leading reason for malpractice claims against EDs (Brown, McCarthy, Kelen, & Levy, 2010). Limited information gathering. The average inpatient remains in the hospital for four days, while the average ED patient stays for just four hours (Press Ganey Associates, 2010; “Number, rate, and average length of stay,” 2010). Furthermore, for a patient who is still early in his or her disease process, the challenges may only grow upon ED discharge. Although most clinical conversations between patient and ED provider end once the patient is discharged, in my experience the condition of roughly one in 20 discharged patients will worsen or an aftercare barrier will arise (Scaletta, 2014). Consider, for example, a patient who feels worse the day after ED discharge but hesitates to return because the discharge instructions specified a two-day window for feeling better. Lack of prompt medical attention to this patient’s changing symptoms could potentially lead to an adverse event. The IOM report recognizes the importance of timely information capture and flow—in other words, better communication—to support the diagnostic process. In fact, of the eight goals outlined in the report, the first calls on providers to “[f]acilitate more effective teamwork in the diagnostic process among health care professionals, patients, and their families” (Balogh et al., 2015, p. 6). Other goals speak to developing an environment of reporting diagnostic errors and near misses and ensuring that health information technologies (IT) support patients and healthcare professionals in the diagnostic process (see sidebar). Improving post-discharge conversations with ED patients through technology can help ED providers extend the information-gathering process, as well as address about half of the IOM report’s goals. For example, an automated survey mechanism can be used to assess the patient’s next-day well-being. This “digital conversation” can uncover clinical complaints and service gaps that otherwise would go unchecked and potentially create a barrier to quality care. 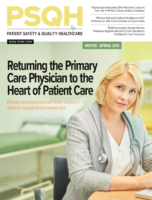 An automated surveillance system can send discharged patients a text or email with a small number of self-assessment questions to assess how the patient feels, medication concerns, the level of physician/nurse satisfaction, and overall experience. Whenever a patient indicates that he or she feels worse, a chain of events is triggered, starting with a pop-up message that tells the patient to call his or her physician or return to the ED. At the same time, the tool sends the patient’s comments about why he or she feels worse to the ED charge nurse. After consulting with an ED physician, the nurse calls the patient, often within five minutes. In addition to empowering providers to rapidly respond to what could be a serious condition and avoid a negative outcome, this level of response reassures the patient and builds patient satisfaction and loyalty. For example, one patient who presented to the Edward Hospital ED appeared to be suffering from severe back strain. When contacted via automated text message the day after discharge, he indicated that some neurological symptoms had just surfaced, including weakness and numbness in his legs. He was immediately instructed to return to the ED and underwent emergency surgery for an epidural abscess.